If you are looking for an elegant belly bar for a special occasion or just a treat then look no further. 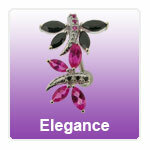 These designs will certainly add a touch of sophistication to any outfit. All belly bar styles in this section are available in 6mm, 8mm, 10mm, 12mm and 14mm with either 316 Steel, Titanium or Bioplast shafts (see colour charts below).